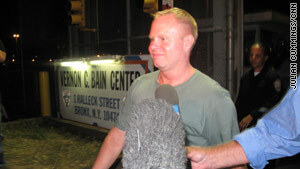 Flight attendant Steven Slater leaves jail after posting bail on August 10 in Bronx, New York. (CNN) -- A JetBlue flight attendant whose fame took off after his dramatic exit down an emergency chute is is no longer employed by the airline. JetBlue spokeswoman Jenny Dervin told CNN on Saturday that Steven Slater no longer works for the airline. She said that the separation occurred last week, but declined to elaborate how Slater and the company parted ways. Slater became a hero to some after an August incident when, authorities said, he grabbed some beer and triggered an inflatable emergency chute from a plane at a JFK Airport terminal in New York. As of Sunday, Slater had amassed more than 210,000 "fans" on a public Facebook page. The drama on the plane may have started before takeoff. "A number of passengers were competing for overhead carry-on luggage areas," Howard Turman, Slater's attorney, has said. "With great difficulty, they were shoving the bags around, attempting to get it in. Steven came over to assist and either the bag or the overhead (bin door) hit him in the head and at that point he suffered an injury." Turman has also said a woman "started cursing and -- based on the information -- slammed the overhead luggage bin on his head." After various exchanges with the woman and a crew member, some passengers said, he grabbed some beer from the beverage cart before deploying the emergency slide and leaving. Turman has sharply denied a JetBlue passenger's assertion that the flight attendant instigated the confrontation. JetBlue removed Slater from duty following the incident and launched an internal investigation. Slater has pleaded not guilty to charges of reckless endangerment and criminal mischief -- both felonies -- and criminal trespass. If convicted, he could face a maximum of seven years in prison. Slater has a court appearance scheduled for Tuesday. CNN's Allan Chernoff and Tom Watkins contributed to this report.